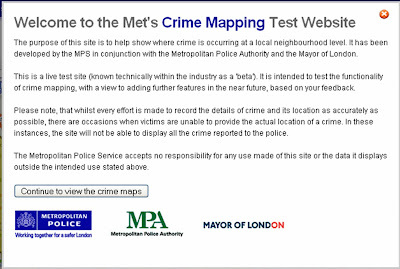 Boris Johnson’s election manifesto contained a pledge to introduce an online London crime map and the Metropolitan Police have just launched a beta / test version, pending a formal launch in September. Greater London now has crime mapping that provides monthly crime details on a neighbourhood level, helping the public be more aware, whilst assisting local police forces prioritise resources and develop local policing strategy. Basing the system on the Google Maps platform has speeded implementation and as a result the public now have access to London crime statistics with specific details for burglary, robbery and vehicle crime. 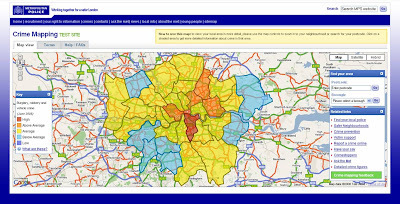 The London Crime Map allows users to search by postcode or by borough and colour codes areas based on whether crime levels are ‘high’, ‘above average’, ‘average’, ‘below average’ or ‘low’ – with Southwark currently rated as the worst London borough. 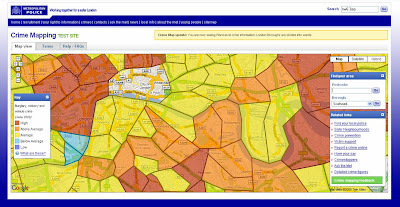 I believe that allowing greater public access to government data can only be a good thing, however others argue that opening up this sort of data could also have negative consequences, asking questions like 'what happens to property prices on your street if the London Crime map describes your area as 'above average?' etc. However time will judge whether the London Crime Map is a good use of £210,000 or a big red herring. I'm also intrigued to see if crime mapping will become integrated into TV police drama. 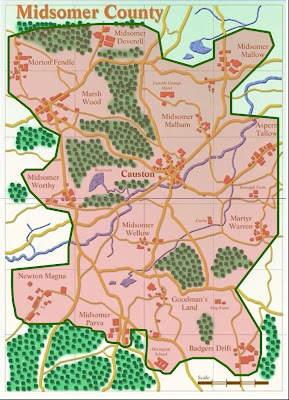 What would happen in a place like Midsomer if a publicly searchable crime map was available? The plot would surely have to take notice of a readily accessible map mashup of 113 murders across 11 years? While the data is sparce, it is much more recent on SpotCrime.com. By just taking news reported data, anyone can see trends like the multiple stabbings in Croydon.